Pat O’Day is a radio legend in the Pacific Northwest. He was Seattle’s highest-profile DJ and dance promoter in the 1960s. Twice the national radio industry named him top radio “Program Director of the Year,” and in 1966 he was voted the nation’s “Radioman of the Year.” He held such firm control over the Puget Sound radio business from his seat at KJR radio that in 1967 a federal anti-trust suit was filed against him. The next year Pat O’Day helped develop Concerts West, which would become the largest concert company in the world. The acts the company handled included Jimi Hendrix, Led Zeppelin, Chicago, The Beach Boys, Boy Dylan, Elton John, Three Dog Night, Frank Sinatra, and, yes, Elvis Presley. 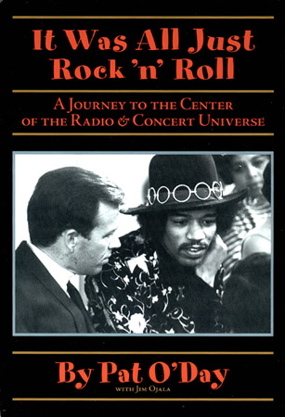 In 2002, semi-retired O’Day told the story of his radio and concert promoting years in It Was All Just Rock’n’Roll, published by Rock ’n’ Roll Press in Seattle. In it he relates his bizarre encounters with Colonel Parker through the years. When Elvis decided to go back to concert touring in 1970, O’Day’s Concerts West company wanted desperately to be Presley's promoter. When Pat approached Parker about it, the Colonel made a startling request. As an indication of good faith, he told Pat to come back the next day with a check for $1 million, made out to Parker personally. Only then would he consider doing business with Concerts West. Pat talked it over with his partners, and they decided to comply with Parker’s demand. When they walked into Parker’s hotel suite the next day, the first thing he said was, “Did you bring the money?” When the cashier’s check was handed to him, the Colonel looked at it briefly and threw it on the cluttered floor nearby. “Ok, let’s sit down and talk!” he said. When the group went downstairs later for dinner, the check was still on the floor. 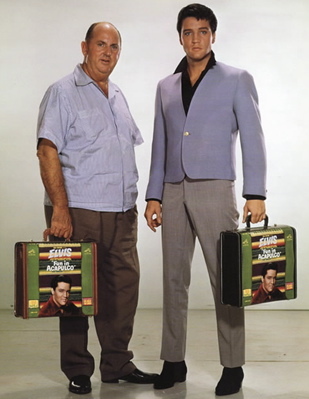 (One wonders if Elvis ever saw any of that $1 million or if it all just went into his manager’s pocket.) The deal was struck, though, and Concerts West handled every Elvis Presley concert from then until his death seven years later. During those years, Pat O’Day observed several examples of what he called the Colonel’s “twisted sense of humor.” One morning, O’Day wrote, Parker called the Concerts West home office in Bellevue, Washington, with a strange request. He had learned of a farm near Portland, Oregon, that raised miniature horses. He wanted someone to go down there, buy two of the three-foot high animals, and ship them to Barron Hilton in Las Vegas. The partners drew straws, and the loser was off to do the Colonel’s bidding. Parker knew Hilton would be out of town when the tiny horses arrived in Las Vegas. The Colonel had arranged for a couple bales of straw and a wooden fence to be set up in Hilton’s office, and the horses were placed inside. When the Barron returned, he found his office filled with straw, horses, and the smell of manure and urine. He also found a birthday card from the Colonel and Elvis. Hilton didn’t know what to think. He knew his hotel and casino made millions off of Elvis, so he didn’t want to insult Parker. He decided to move to another office and leave the horses in possession of his old one. A month or so later, when the Colonel showed up unannounced to see Hilton, he was surprised to see the horses were still there. After being directed to Hilton’s new office, he said, “Barron, you still have those dumb horses in your office! For God’s sake, get rid of them! Can’t you take a joke?” Then he walked out. 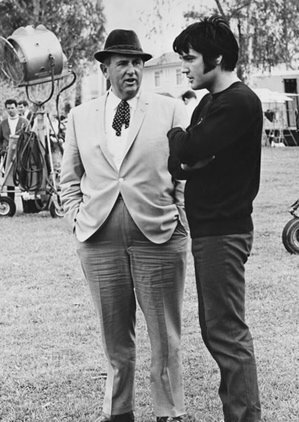 Like Hilton, many other executives in various areas of the entertainment world were dependent on Elvis for a good deal of their companies’ profits, and that made them vulnerable to Parker’s practical jokes. O’Day writes of one “nasty trick” the Colonel pulled on RCA Victor. The shocked RCA exec quickly assured Parker that the company had the utmost respect for him, and then gently inquired what happened to upset him so. The Colonel explained that he had never asked anything of RCA, had always been generous with the company, and so on, and really his birthday was not so important. But when someone from RCA had called to tell him the company was going to erect a giant billboard saying “Happy Birthday Colonel Parker, RCA Loves You” on the highway near his Palm Springs home, he gathered some of his closest friends and drove them out to see how much RCA loved him. And what did he discover—no billboard. Feigning humiliation and tears, Parker hung up. Parker then called three friends and they all piled in his Cadillac and drove to the outskirts of Palm Springs. There they laughed convulsively as they watched the Colonel’s giant birthday card being painted by the side of the highway. Not all of Colonel Parker’s shenanigans were as humorous to Pat O’Day. The promoter remembers a big problem Concerts West had with the state of Tennessee in the early seventies. It seems the state’s Attorney General and Department of Revenue had discovered that tickets for the first four rows of some Presley concerts were forged and sold without paying the state the required admission taxes. It didn’t take long for O’Day and his partners to discover that Colonel Parker was behind the scam. In cahoots with a Concerts West executive, Parker was printing the tickets, selling them on the sly, and pocketing the cash. When called on the carpet, the Concerts West exec claimed the whole thing was Parker’s idea, and he had no choice but to go along with it. The money went to pay off gambling debts, he claimed. 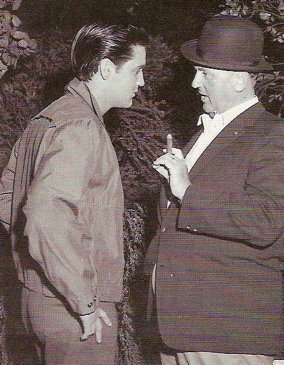 It is an example of how Parker’s control of Elvis made business associates vulnerable not only to the Colonel's practical jokes but also to his shady business deals. “The side of the Colonel that wasn’t so funny found him doing next to nothing as his golden goose slowly killed himself. It was no mystery what was going on with Elvis. When I visited with him in 1970, I met with a shy, thin, dynamic, proud, energized icon of rock ’n’ roll. When I tried to talk with him again six years later, I encountered a bloated, overweight, shockingly pale, psychotic mess. “Colonel Parker continued to book one tour after another for a desperately ill man. Never has someone needed intervention more than Elvis did then, and the Colonel had the power over him to accomplish it if he chose. One is left to wonder whether Parker feared he would lose that power over a sober Elvis. We’ll never know.